Foundation settlement is often the first step to serious foundation damage, including wall cracks, sticking windows, tilting chimneys, jamming doors, and, most importantly, the potential complete failure of the foundation itself. The problem will only become worse (and more expensive to repair) over time, so it's best to begin repairs for foundation settlement area right away. Many different methods of leveling settling foundations have been applied over the years. These solutions, ranging from replacing the foundation entirely to less dramatic solutions like installing piers to support the foundation have all been applied. These solutions are vary in how successful they are, and while they all look attractive on the surface, they are not equal. Call or contact us online today to meet with a foundation expert for a free foundation leveling quote in Peoria, or the surrounding areas in Iowa, Illinois, and Missouri such as Quincy, Pekin, Galesburg, Burlington, Ottumwa, East Peoria, Hannibal, Macomb, Canton. Foundation settlement will continually compromise a structure. Eventually if it's not repaired or replaced, the foundation will fail completely, with potentially disastrous results. Foundation replacement is the most invasive, expensive, time-consuming, and disruptive solution, but if the foundation has deteriorated to a very advanced stage, it can be the only way to address the problem. Foundation replacement is a very work-intensive project. The entire perimeter of the foundation will need to be excavated, and all landscaping must be removed. Shrubberies, trees, gardens, walkways, steps, porches, and other landscaping will need to be removed, and mounds of dirt will be heaped around the area. Temporary supports will be set in place to keep the house upright, and the foundation walls will be removed and rebuilt. After the foundation has been rebuilt and the mounds of dirt and landscaping have returned, the backfilled soil will experience some settlement- the area will need to be regraded in a year or so. Additionally, if nothing is done to help with the original problem of foundation settlement, the same problems that caused your first foundation to fail may also affect the new one. Foundation piering is usually designed with a rugged steel pier and bracket. The bracket is designed to connect the pier to the foundation footing, while the pier itself extends downwards to strong supporting soils. These piers can perform effectively in most soil conditions, and they last for more than a hundred years. helical piers and push piers, with each option having its own strengths. Foundation Supportworks of the Tri States of Iowa, Illinois, or Missouri is a certified installer of the Supportworks, Inc. line of galvanized steel foundation piers -- call or contact them online today for a free foundation leveling quote! If you're looking for an efficient way to add structural support in a smaller, lighter structure, the Supportworks Helical Pier System is a great option. Able to support patios, porches, steps, and similar structures, they can provide long-lasting support with an installation that lasts about a day. Helical piers are created with a steel shaft and corkscrew-like end. 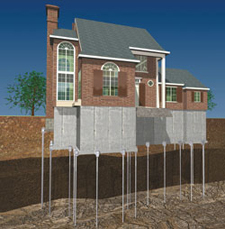 To properly install them, an area around the foundation must be dug out for each one. The pier is then driven into the ground below the structure. A bracket is attached to the footing of the structure, and to the helical pier shaft. Helical piers install easily on older or weaker structures and can be used for pre-construction or new construction bearing systems in poor soils. FSI Foundation Push Piers, provided by Foundation Supportworks of the Tri States, can provide the maximum in foundation support. 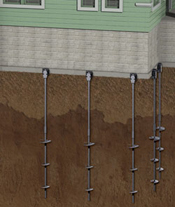 Able to drive deep into the earth to bedrock or solid supporting strata, they offer an appropriate solution for homes and heavy structures. Because they install with very little friction, they can penetrate deeply without warping or bending. Push piers are also able to be used in low-impact interior installations. Once installed, push piers allow for the opportunity to raise the foundation structure to a flatter, more level position. 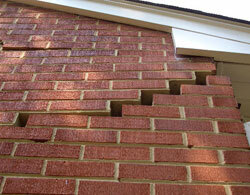 As the foundation rises, cracks in stucco, drywall, brick, and exterior finishes can close. Sticking doors, leaning chimneys, and jamming windows can be improved, and the value of the home can be greatly restored. If you'd like a free, no obligation estimate to level your settling foundation in Peoria or the surrounding areas, call or contact Foundation Supportworks of the Tri States of Iowa, Illinois, and Missouri today! We serve in areas like Quincy, Pekin, Galesburg, Burlington, Ottumwa, East Peoria, Hannibal, Macomb, Canton, Oskaloosa, Fort Madison, Keokuk, Fairfield, Mount Pleasant, Monmouth, Washington, and nearby.